For the past three years, the Medellín-based project HiperBarrio project has focused on shining a light on different neighborhoods around the city, such as La Loma, as well as other parts of Colombia. However, it has been the hard work of the project coordinators, and especially, the new bloggers, who have added life to the project. This is another interview with one of these bloggers, Yesenia Corrales, who will also be present at the Global Voices Citizen Media Summit in Santiago, Chile that will be held on May 6-7 to share her experiences with the project. Soon enough, the first members of the HiperBarrio project in La Loma started to do just that. The way that they communicated the history of their neighborhood began to change. The team began the process of “rescuing the historical and cultural memory” of La Loma and according to Yesenia, started publishing “anecdotes that frequently happen in a lovely corner in the northwest Medellín” on their blogs. Yesenia will be in good company at the GV Citizen Media Summit, where she will join other representatives from other Rising Voices projects to share not only their hopes for their projects, but for citizen media everywhere. 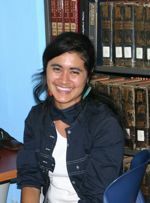 Like many of Hiperbarrio's members, she is active on many social media sites, such as her Twitter and Flickr. Congratulations to Yesenia for been awarded the possibility of participatin in GVO Summit in Chile. I’m happy because now you have in mind another concept in the world. A hug.